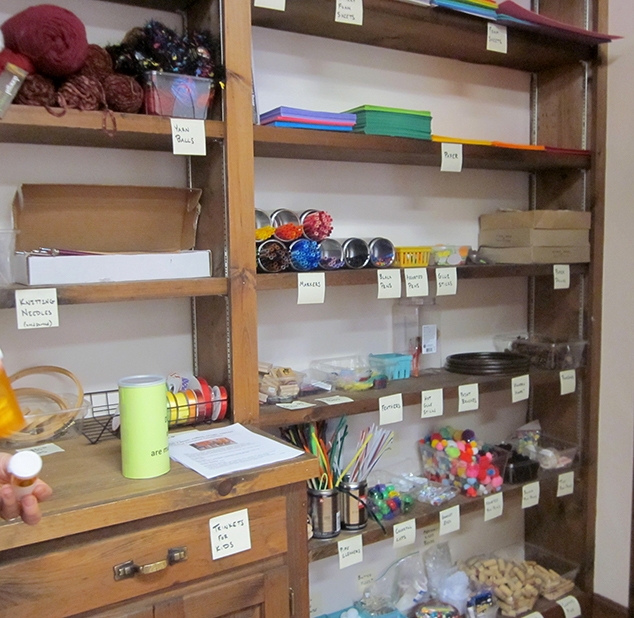 A growing collection of brightly colored paper, pens, pipe cleaners, ribbons, yarn, fabrics, and other odds and ends that might otherwise have ended up in the landfill are available for creative re-use at The Hub Closet. Starting Saturday, December 1, the Hub Closet at the Andover Hub will be open to the public regularly on the first Saturday of each month from 10 AM to Noon, featuring the Tinker Table. Each month the Tinker Table will have an assortment of donated materials available for users of all ages — kids included, of course — to combine with their own imaginations to create a piece of art, a toy, a useful product or a decoration. On December 1, tinkerers can use corks and other supplies to create reindeer and other winter decorations. The theme for January 5 will be creating bookmarks to help get your New Year’s reading goals off to a good start with various materials available for use. Each first Saturday will also be a time for purchasing supplies, at very low cost, and for donating supplies to the Hub Closet for others to use. The Hub Closet will also be open on a self-serve basis every week on Tuesdays and Thursdays from 8:30 to 1 AM for both picking up supplies and dropping off donations. The Hub Closet is off to a good start on supplies but will always be collecting new ones. Those interested in donating materials to the Hub Closet, have any questions or ideas about the Tinker Table, or would like to volunteer to staff an occasional Saturday morning, please contact Tina at hubcloset@nullgmail.com.